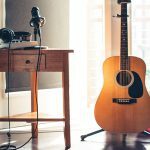 To work efficiently in a professional recording studio requires a suitable working environment – but not only professionals benefit from a studio desk specially tailored to their own production environment! But why should you do that? A large table with enough storage space does it, or doesn’t it?! You may have been part of this or similar kind of discussions on the subject of studio work. And maybe you’ve already asked yourself: What exactly are the advantages of a professional desktop? Let’s start with the actual center of every computer-based studio – the computer screen. 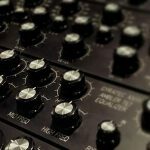 Although the audio interface or a combination of preamps and A/D converters functions as the control center of your signals, in daily production business it is usually the computer screen that has your permanent (visual) attention. The problem with this: It is usually very large and takes up a lot of width and height space on your desk, especially when your projects are getting more and more complex and you need to add a second (or even third) monitor to your setup. This turns computer screens into unwanted, non-absorbent reflection surfaces in the middle of your stereo triangle and influences, among other things, the precise positioning and placement of signals in the mix. Even with our studio furniture, such as the session desk models Oktav and Gustav from the BASIC series, you will never be able to completely overcome this fundamental problem. However, thanks to the height-adjustable middle part, you can significantly reduce this effect and safely set up your visual control center and integrate it into your setup. 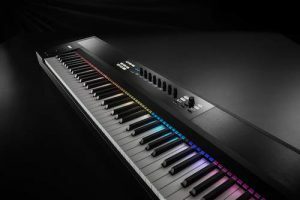 A large master keyboard with 61 or 88 keys is a great thing and with its variety of controllers it offers almost infinite possibilities in your everyday production. But where to put it? If you love weighted keys and/or a hammer action keyboard, master keyboards quickly become bulky space robbers that somehow always get in the way when you don’t need them. Anyone who has ever seriously tried to use a combination of mouse and keyboard on the keyboard knows what we’re talking about. 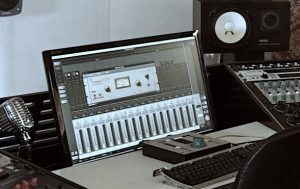 Side placement at a 90° angle is also rather uncomfortable if you want to adjust your samplers, synthesizers or other plug-ins on the screen at the same time – an absolutely ergonomic no-go, also because you have to leave your sweetspot over and over. For this reason, we offer our sessiondesk BASIC models Quintav and Oktav with an optionally available keyboard drawer (because not everyone uses a keyboard instrument), which you can slip out and in depending on your needs. This way you save space, automate your workflows and stay in your creative flow, without getting dizzy or having to rely on shaky in-house designs. 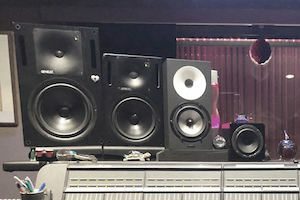 The choice and meticulous placement of studio monitors in the respective room is a topic for entire (acoustic) libraries – we don’t want to bore you here any longer. However, one crucial point cannot be emphasized often enough and should therefore always be taken into account: your stereo triangle. You build this when your speakers and you form an equilateral triangle so that the listening distance between you and your speakers corresponds to the distance between the speakers itself. Furthermore, it is crucial that your ears are approximately at the height between tweeter and woofer/midrange transducers. This is where the acoustic axis of the loudspeaker runs (for 2-way systems) which promises optimum sound quality. 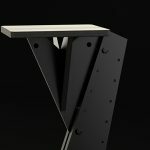 All Sessiondesk tables of the BASIC series offer an upper shelf for near-field monitors so that you don’t have to rely on self-made constructions from stacked books or the like on your desk. And last but not least, you ensure that the placement of your loudspeakers on our shelf meets the basic requirements for an ideal stereo triangle. 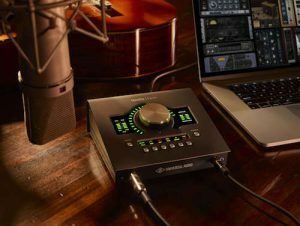 We’ll skip the exclusively analog nerds and assume that you have an audio interface and work at least partially in the digital world. You may own one of the many desktop interfaces that can be conveniently positioned within easy reach on the desktop surface and causes practically no ergonomic workflow problems. But how do you best position a 19″ interface? And what to do if you own several 19” devices? If you haven’t bought a rack yet, you’re likely to be stacking your valuable external A/D converters, preamps, channelstrips, or FX on your desktop, making several mistakes, of which non-existent fixtures and lack of ventilation distances are only the most obvious. Under these circumstances, ergonomic working is virtually impossible. Furthermore, 19” towers above a certain height are an acoustic obstacle that can destroy your valuable spatial sound and your precisely aligned stereo triangle. Each of our BASIC models – Gustav, Quintav and Oktav – offers you 18 U of rack space, divided into several rack units, so you can flexibly adapt your 19” devices to your workflow as well as neatly wire it up and have the displays and controls on the fronts in view at any time. As you can see, a professional studio desk can simplify your production life in many ways and moments and improve your compositions, mixes and masterings without the need for time-consuming measures on different levels.